Managed care organizations are trying to expand and protect market share while also juggling multiple initiatives related to healthcare reform. Although HIX is an Accountable Care Act (ACA) requirement, it is too complex to be managed as a sub-program of healthcare reform. The impacts are pervasive for a MCO and are a significant addition to the challenges of managing multiple initiatives, investments, and constrained resources. HIX is comprised of three major work streams that have to be addressed concurrently. Each of the work streams has its own set of requirements, implementation tasks, and timelines that must be managed within the HIX program. In order to participate in the Exchange, MCOs must be certified as Qualified Health Plans (QHPs). MCOs already comply with some of the requirements, such as; state licensure and solvency requirements. However, MCOs must also meet requirements specific to Exchanges. If a health plan is licensed in multiple states, they must meet the Exchange certification requirements for each of the states in which they plan to participate. Accreditation by NCQA and URAC will satisfy phase one of the accreditation requirements for the Exchange. However, if a health plan is not accredited, a plan will need to be developed to obtain accreditation. Once the Exchanges are up and running in 2014, HHS will provide more direction regarding additional accreditation requirements. Operations and IT are both impacted by the implementation due to the pervasive nature of the Exchange. 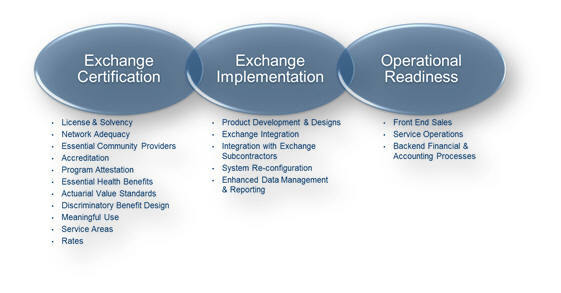 There are three key areas that need to be considered for implementation: 1) which systems require re-configuration or software development, 2) where are the integration points with the Exchange(s), 3) what is required to enhance my data management and reporting capabilities to support the Exchange and manage the MCO’s risk The immaturity of the Exchange model and the impending deadlines pose a challenge for MCOs. In order to successfully prepare for the Exchange, MCOs need a clear understanding of their current capabilities, where they have the capacity to expand those capabilities to support the Exchange, and where additional development work is required. Implementation plans must take into account testing cycles within the MCO, as well as, testing with the Exchange. Testing with external organizations adds a level of complexity and time to the MCO’s implementation plan and has a direct impact on operational readiness. The operational impacts for Exchanges begin at the front end sales processes and extend through the backend financial and accounting processes. As MCOs prepare their operation for Exchanges, they need to consider: 1) which processes need to be developed or remediated, 2) do my staffing ratios need to be modified to support the Exchange processes, 3) do I have the right skill sets or do I need to expand the skill sets for my organization, 4) who needs to be trained on the new processes and when do they need to be trained. Implementation of the new and/or revised processes is an iterative process and should be monitored post production to ensure processes are executed efficiently and effectively to meet the requirements of the MCO and Exchange. The establishment of periodic evaluations will ensure that processes are updated as the Exchange requirements evolve and they are continuously refined for efficiency within the MCO’s operation.